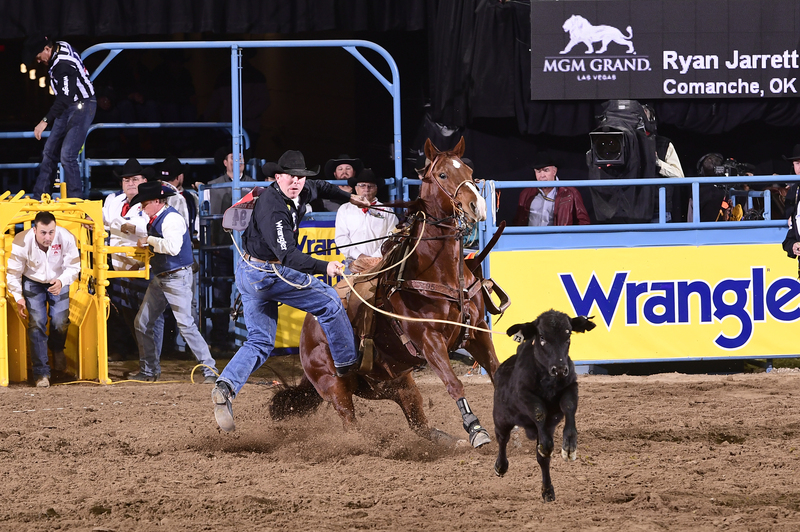 LAS VEGAS – There isn’t a hotter tie-down roper over the last five rounds of the National Finals Rodeo than Ryan Jarrett. He has placed each of those nights, including at least a share of two round wins, and has pocketed $90,526 heading into Saturday’s final round of the 2018 ProRodeo season. He has increased his season earnings to $168,077 and has moved up to fourth in the world standings. More importantly, he can surpass the $100,000 barrier if he has a strong finish. On Friday night, he roped and tied his calf in 8.7 seconds to finish sixth in the ninth round of this year’s NFR. That’s a fantastic flurry that has proven beneficial to the Comanche, Okla., cowboy, who failed to collect a check on the first four nights of this year’s championship. But a late scramble is nothing new to Jarrett, who was raised on a dairy farm in Summerville, Ga. He earned his spot to compete in Las Vegas by winning the rodeo in Kingman, Ariz., on the final day of the regular season. He entered the NFR No. 15 in the world standings. Having moved up 11 spots is proof of the talent Jarrett possesses, but he had established that early in his career. He won the 2005 all-around title, claiming the most coveted Montana Silversmiths gold buckle in the game by doing well in both steer wrestling and tie-down roping. Since that season, he has focused his attention on roping, and he’s been one of the best in the business ever since. Counting his qualification in bulldogging 13 seasons ago, he has 12 qualifications to ProRodeo’s grand finale. 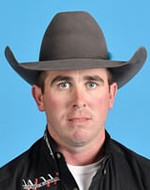 His best finish in tie-down roping came in 2006, when he finished fifth. He has a solid chance to better that this year, and it will come down to Round 10 to decide. Though he’s out of the race for the world title, Jarrett makes his living in the game he loves, and he’s done quite well for himself in a week’s time. That’s a good thing. He and his wife, Shy-Anne, are expecting their first child, a baby girl, in two months. Life is about to change for the Jarretts, but in one of the most positive ways possible. Now, he is riding that wave as he closes out another solid campaign.